Three days have passed since the horrific terrorist attack on Paris, and I am still trying to wrap my head around what has happened. Heart-broken, shocked, surreal. I keep thinking this is a nightmare, and I’ll wake up tomorrow to find life as usual. It just doesn’t seem real. My heart aches for the innocent young people whose lives were tragically lost as they went about their lives on a typical Friday night. Paris has been like a second home to me. I’ve traveled there so often, I lost count long ago. And when I’m not traveling there myself, I’m planning someone else’s trip to Paris. 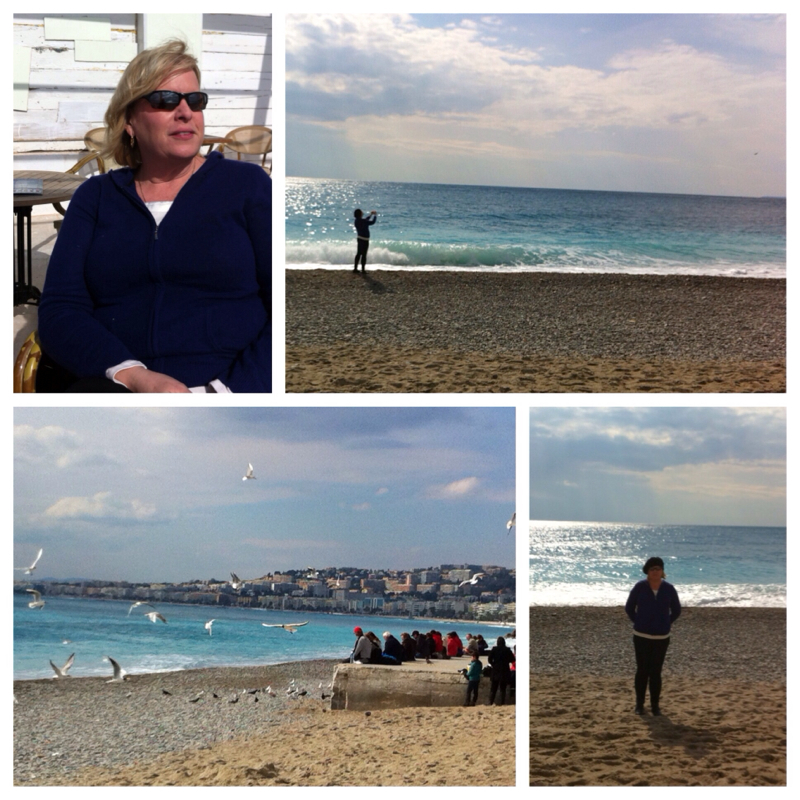 Or teaching classes in France tourism at our local community education. Or writing about France on several blogs. I’ve had the pleasure of taking many of my friends and family members with me. Some of my fondest, most profound memories involve France, and Paris in particular. And while I feel a profound sense of loss, it cannot compare to the heart-wrenching grief the victims’ loved ones are experiencing. My heart goes out to all those affected by this senseless savagery. I will not focus on the strategy to defeat the barbarians; I leave that to law enforcement, the military and world leaders. The French are formal and polite, which can be mistaken for aloofness. But I cannot count the number of times I have been helped and befriended by French people who have gone out of their way to help me, or to share their joy of living with me. Mounia, a sweet stranger (now a new friend), who I met last year at the Starbucks near Opera Garnier, as I was waiting to meet a business contact who never showed up. Mounia sensed I was ill at ease, and she stood at the door with me for 20 minutes, trying to help me locate my colleague. And when it became clear my colleague and I had mis-connected, Mounia and her friend joined me and we sat for an hour, sipping our coffee and chatting. Gani, my waiter at the Eiffel Tower restaurant, who on a whim, asked me to join him for a picnic in the Champs du Mars to watch the incredible fireworks for Bastille Day. It was not a “hook up” or even a date per se, he just wanted to be sure I did not miss the joy of the celebration on that warm summer evening. The waitstaff at the tiny café on Rue Cler who helped me to call a locksmith when I found myself locked out of my apartment. 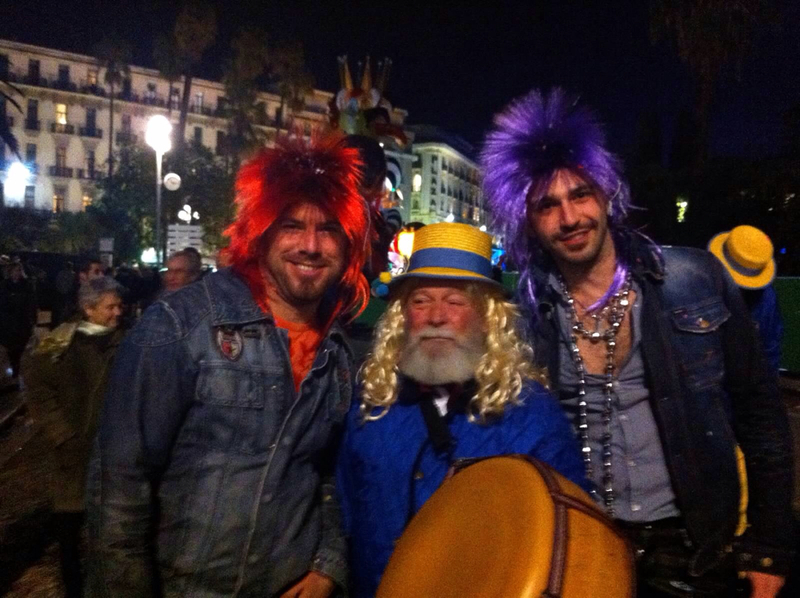 They did not speak English, and my French is horrible. I had no purse, no money, no cell phone (all locked inside the apartment), and was literally in my nightgown on the streets of Paris. But they kept working to understand my bad French (who knows how to say “locksmith” in French?). 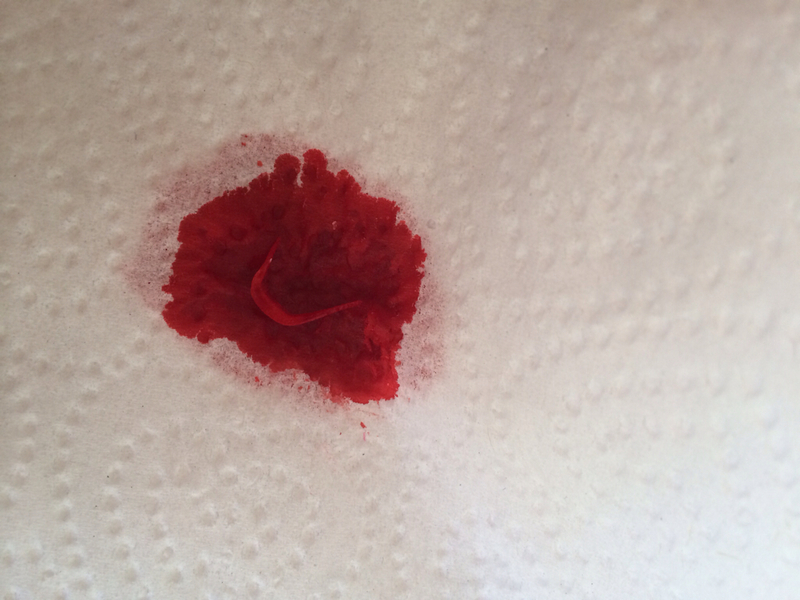 All I could manage was “mon cle…c’est perdu”. They called and had a locksmith there in 30 minutes to help me. And the locksmith himself insisted on giving me instructions on how to pick the new electronic locks, and left the secret equipment with me so I can let myself in next time. David /dah veed/ who I met by sheer coincidence in a coffee shop in Rochester, MN. He shared his laptop with me and schooled me on technology. I learned more from sitting with him for an hour than I would have in a semester-long computer class. SEO, Weebly, Fivver, and much more. The cheesemonger, who with twinkling eyes meticulously put together a perfect cheese tray for me, with the necessary assortment of hard and soft…cow’s, goat’s and sheep’s. My ex-pat friends, who are not Parisian by birth, but got there as soon as they could – Marlys and Michael who I met on Twitter, and invited us into their home on multiple occasions. Ricardo, the darling pastry chef who I would like to adopt. Friend and colleague Madelyn and her French husband, Philippe. Michael and Scott, Lindsey, Ellise, and so many more. And my fellow francophiles who I’ve met through social media, blogger conferences and various other venues who share my love of French culture…Dali, Lanore, Kathryn, Robin, Cynthia, Karen, Robyn, Beth, Julie, Lisa…I know you all join me in mourning the loss of innocent lives, and in honoring the true joie de vivre that is the embodiment of the French people. I long to be back there now. I wish I could go this very week with my friend Dali, but work and family commitments will keep me engaged at home until after the holidays. I want to be there…especially now... to show some small measure of support for the people and country that mean so very much to me. Am I afraid to travel now? Yes, I am. But that will NOT keep me away. 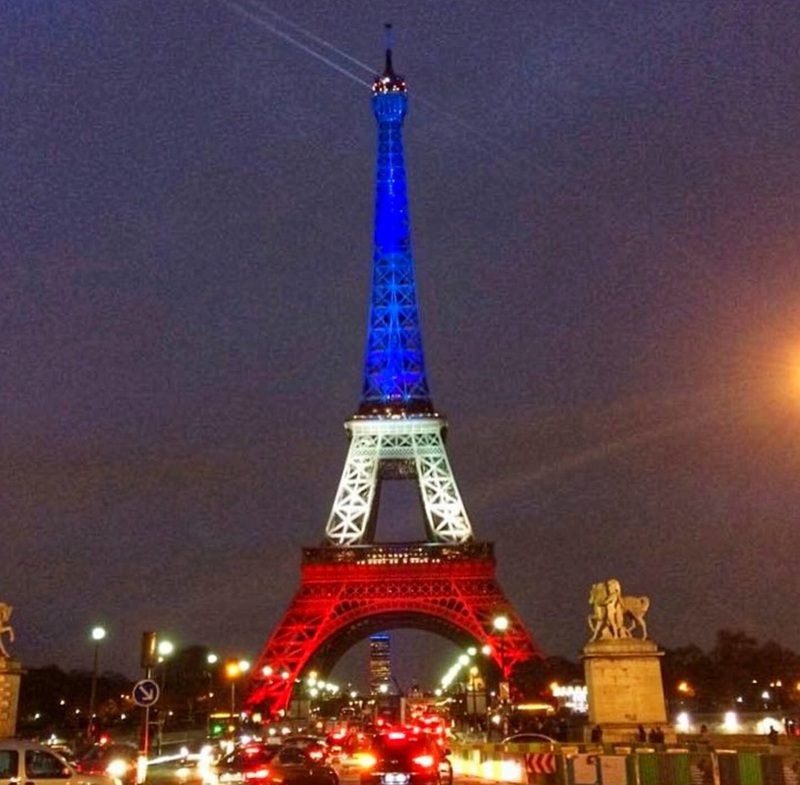 What happened in Paris can happen anywhere, and sadly, already has. NYC, London, Madrid, Beirut, Canada, Australia, Boston. We cannot live our lives under a rock, cowering in fear. Life is short, but is meant to be LIVED. So hug your family and friends very tightly, and look for opportunities to tell them how much you love them, and how much joy they bring to your life…every single day. This tragedy also serves as an opportunity to contemplate our own mortality (another quirky French trait) and the universality of our brief existence on this earth. John Donne wrote, “No man is an island, entire of itself…. Every man’s death diminishes me, because I am involved in mankind. Therefore, never send to know for whom the bell tolls. It tolls for thee.” Whatever God you pray to, ask Him/Her to welcome the dear innocents and provide comfort to their grieving families. 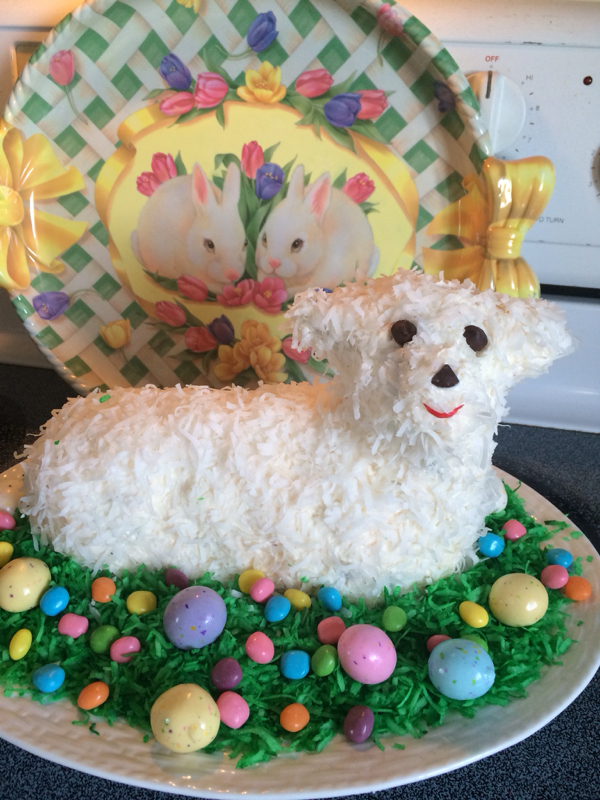 This post has nothing to do with France, but I wish you happy Easter, happy Spring, with my mother&apos;s traditional lamb cake recipe. It&apos;s really easy to make, and will be the centerpiece of your Easter table. Follow my tips, so you can learn from all my previous mistakes. 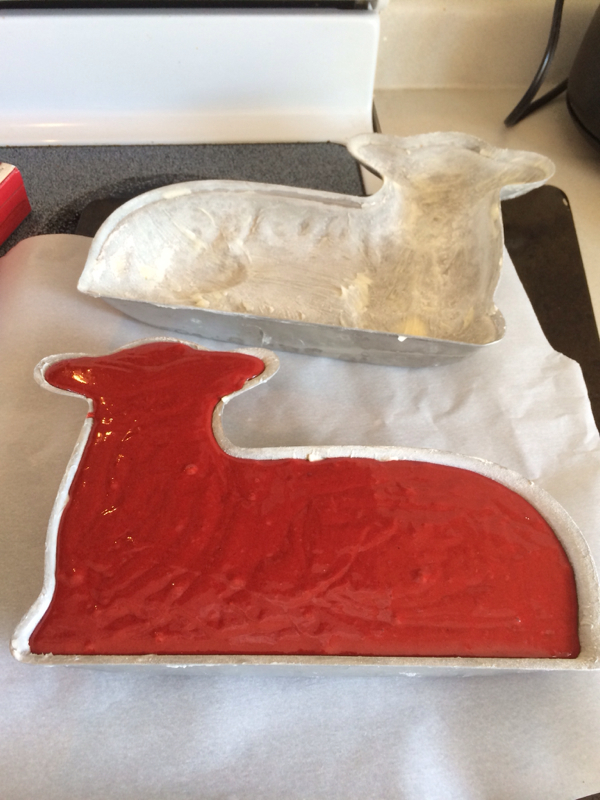 I use a Nordic Ware lamb cake mold, which you can order on Amazon. Follow directions that come with the mold. Most importantly, omit the oil from the cake and reduce the water by 1/4 cup. I used a Betty Crocker mix that calls for 3 eggs, 1/3 cup oil and 1 and 1/4 cups of water. 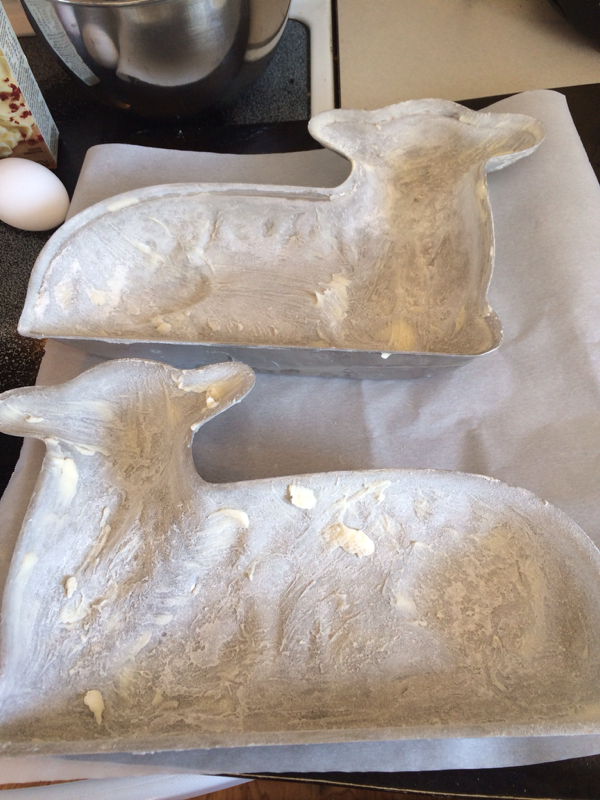 But for the mold, the batter needs to be stiffer than usual so it does not break apart when decorating. 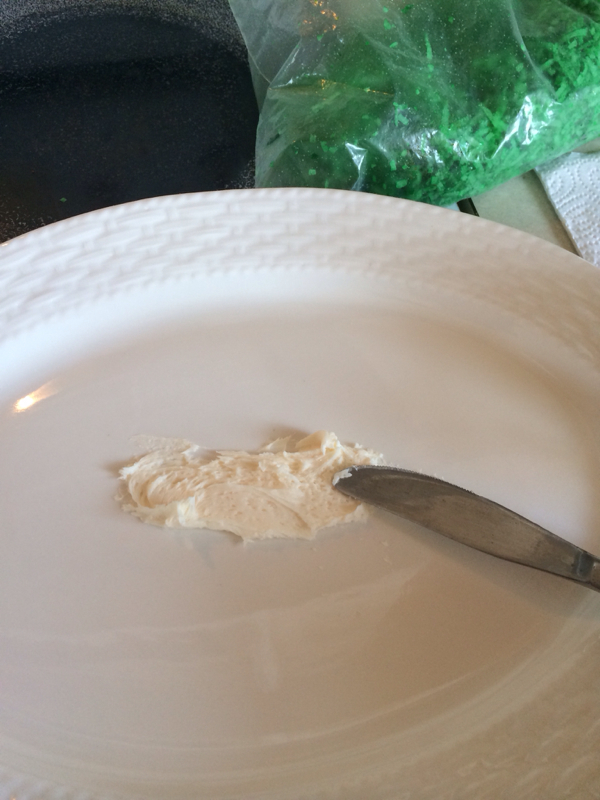 Combine dry cake mix with 3 beaten eggs and 1 cup water, and omit the oil. 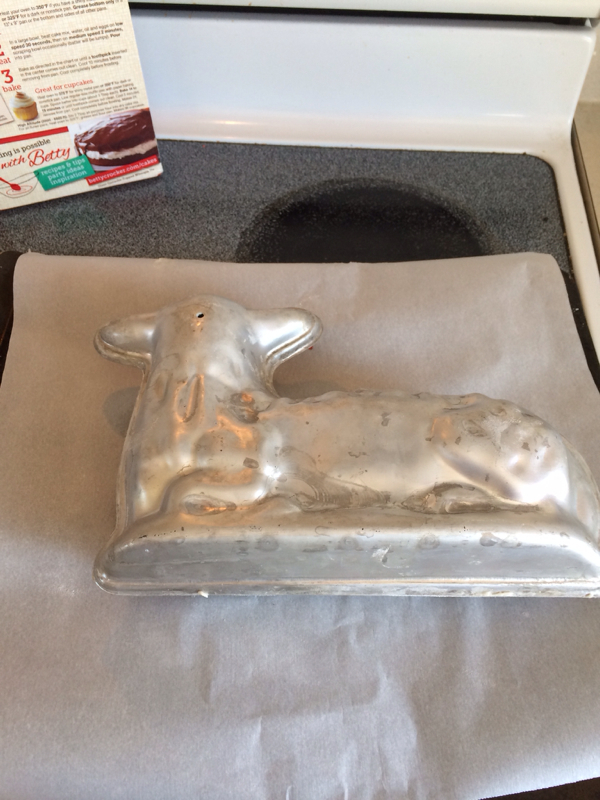 Prepare the cake molds by greasing generously with butter or Crisco, and dusting with flour. 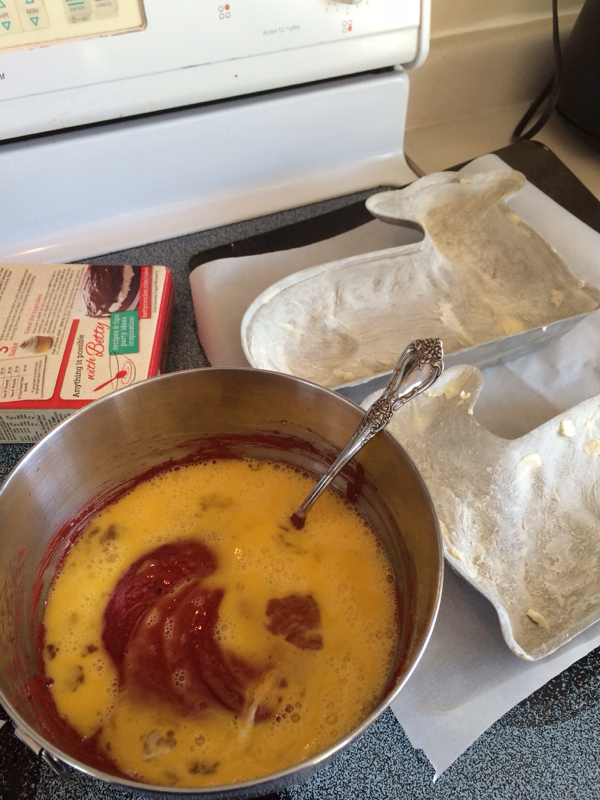 Pour the prepared cake mix into the bottom half of the cake pan (the half without the steam hole). Cover cake with the top half of the mold. As the cake rises, it will grow to fill the top half of the mold. 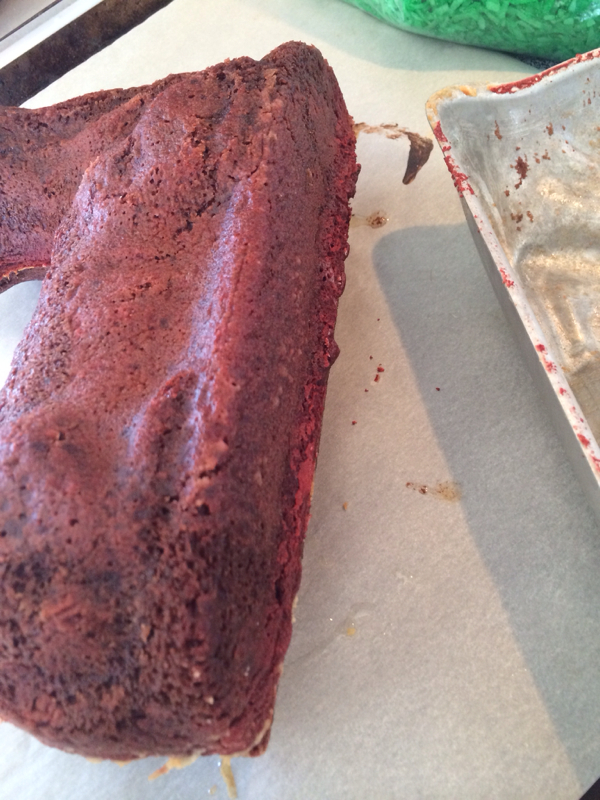 Place the cake on a cookie sheet, which I cover with parchment paper for easy cleanup. You will have a little extra batter left over, so use it for cupcakes. Bake in 375 degree oven for 45-55 minutes. (Cupcake leftovers will be done in about 20 minutes). After 45 minutes, check to see if cake is done by inserting toothpick in the vent hole, and remove from oven to cool. 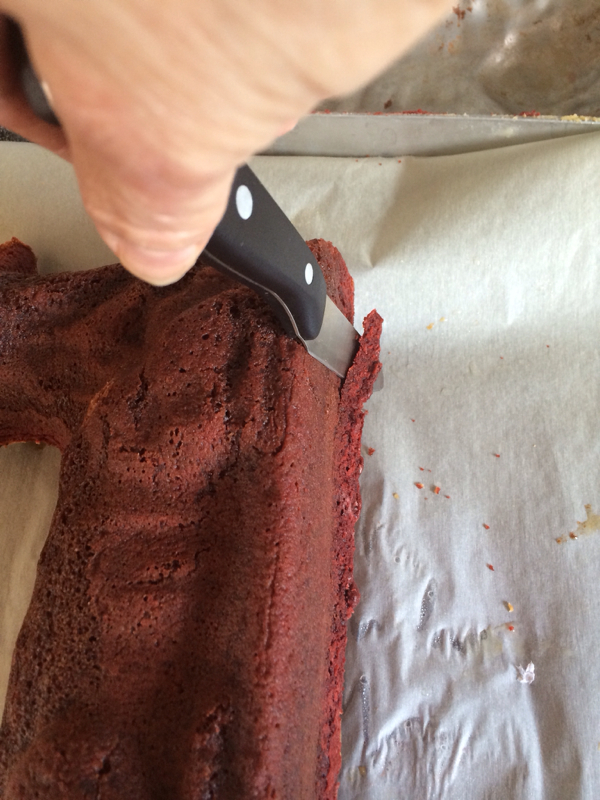 Leave the cake to cool for at least 5-10 minutes, then remove just the top half of the mold. 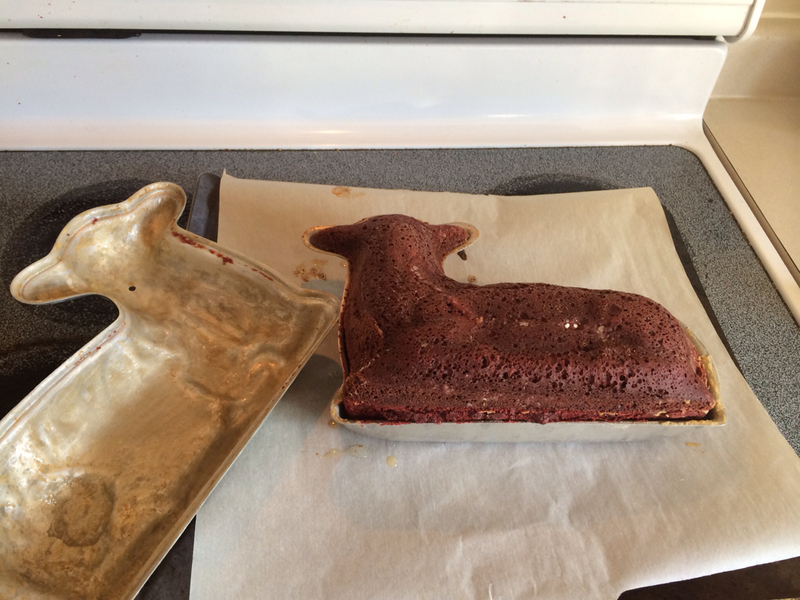 Leave the cake to sit in the bottom half of the mold for 45-60 minutes until completely cool. 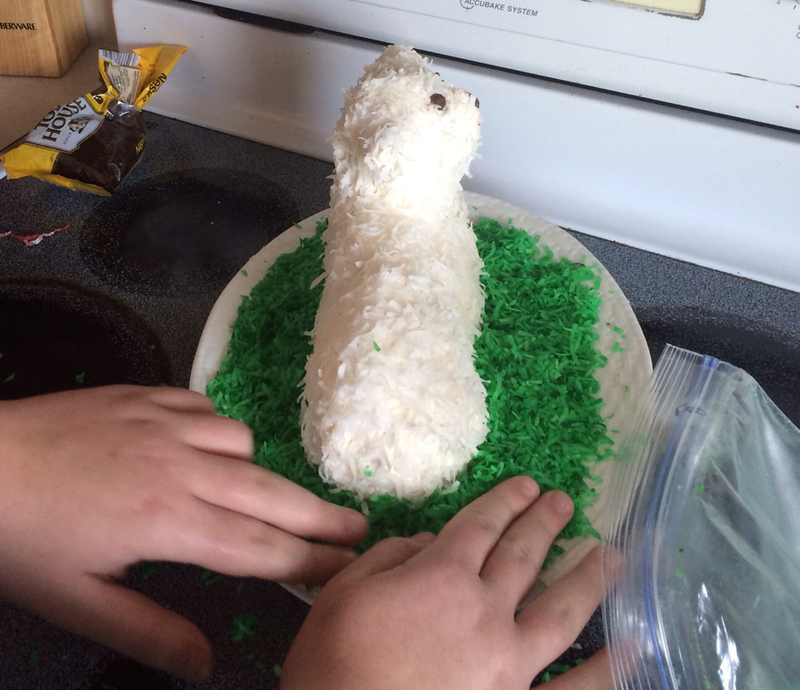 While the cake is cooling, time to make the grass! 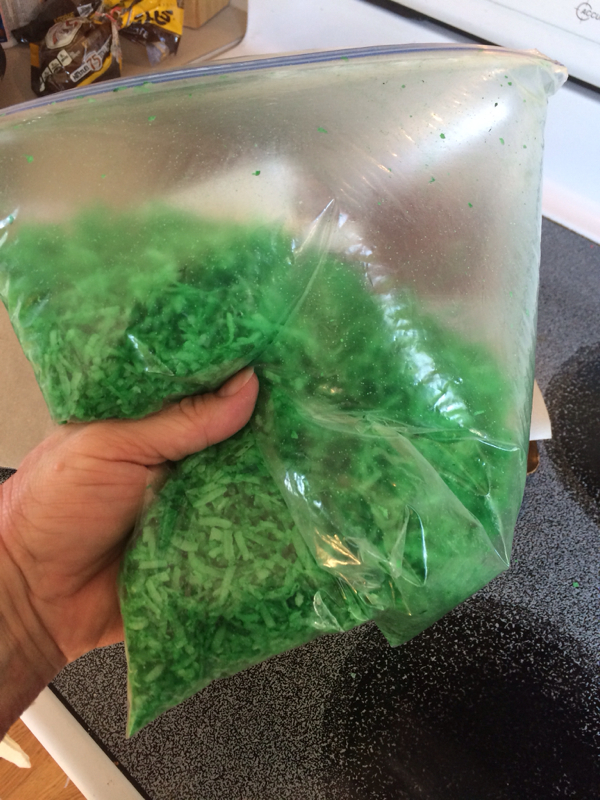 Pour about 1/2 of the shredded coconut into a ziplock bag and add about 20 drops of green food coloring. I like mine deep green, but you can use less coloring if you want pale grass. 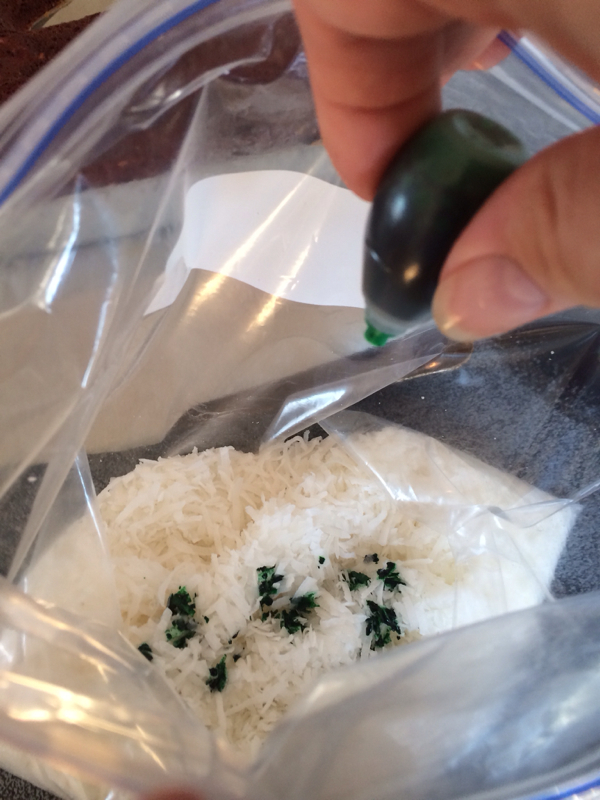 Zip the bag and shake and smoosh vigorously until the coconut is evenly coated. 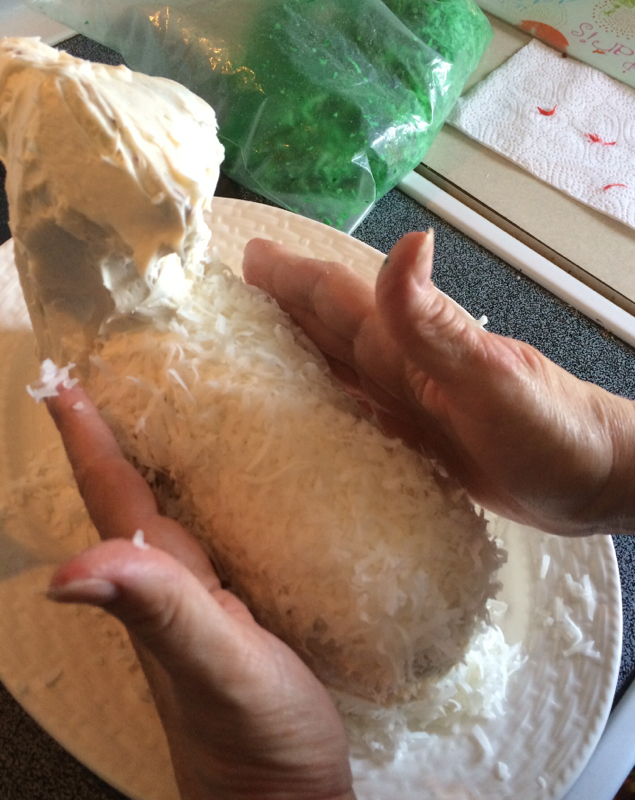 Now, time to select just the right strand of coconut for the mouth. I take a few strands out and look at them to choose one I like. 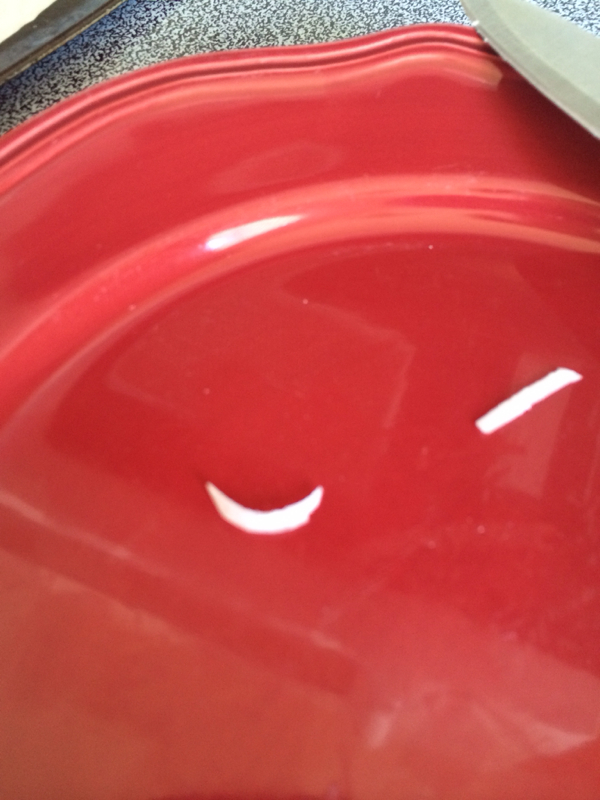 Choose one that has a natural curve for a cute smile! 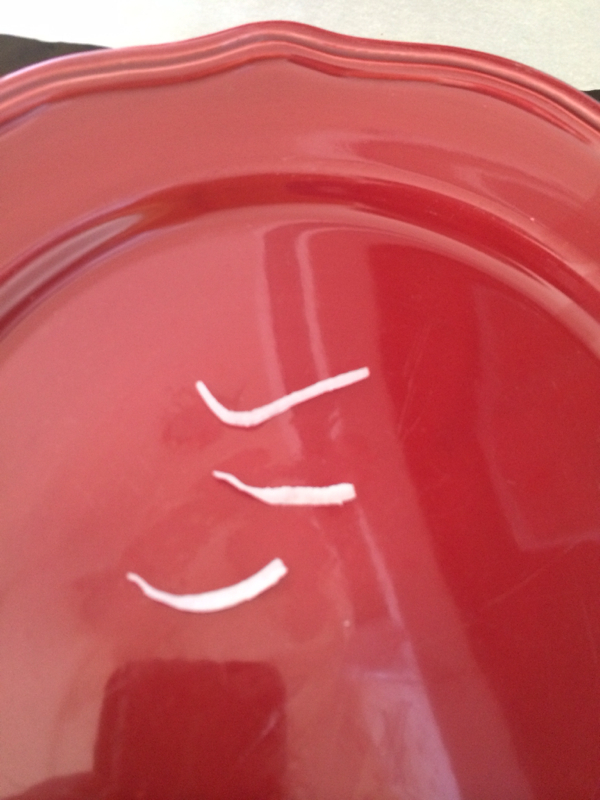 I chose the top strand, and then trimmed it to the appropriate length. 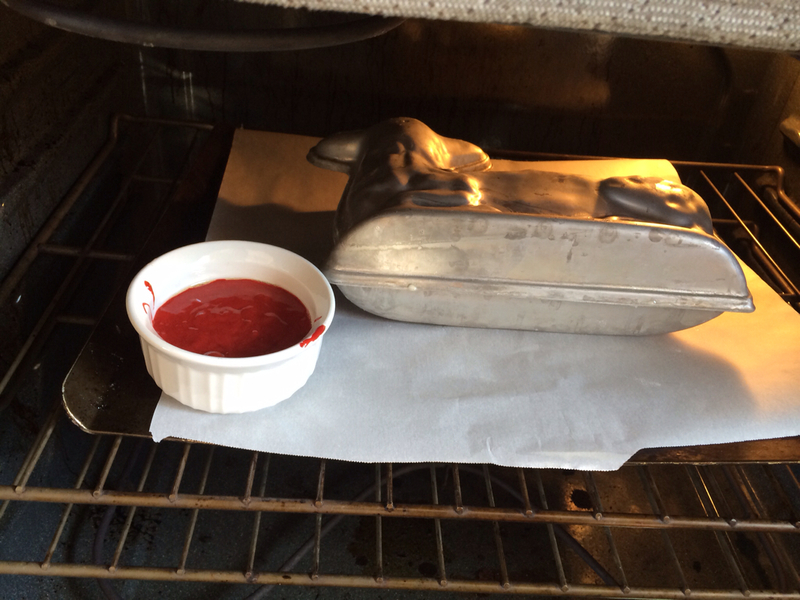 Then add a drop or two of red food coloring to the mouth, and set aside to dry. Then select some chocolate chips for the eyes and nose. If your chips are large, you might need to trim to fit. 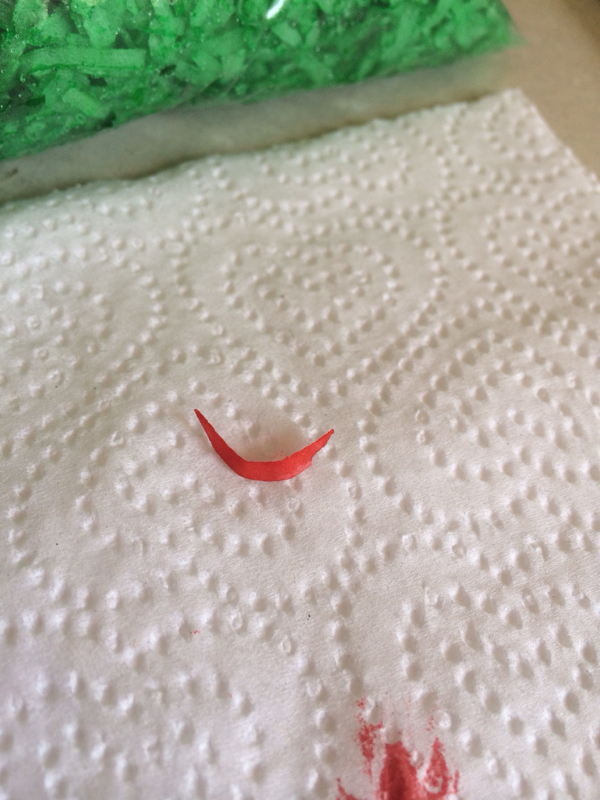 I trim the nose into a triangle shape. Now, when cake is completely cool, gently turn over and let cake slide out in your hand. With a sharp knife, gently trim off the bottom seam to get a smooth edge to allow the lamb to stand firmly. 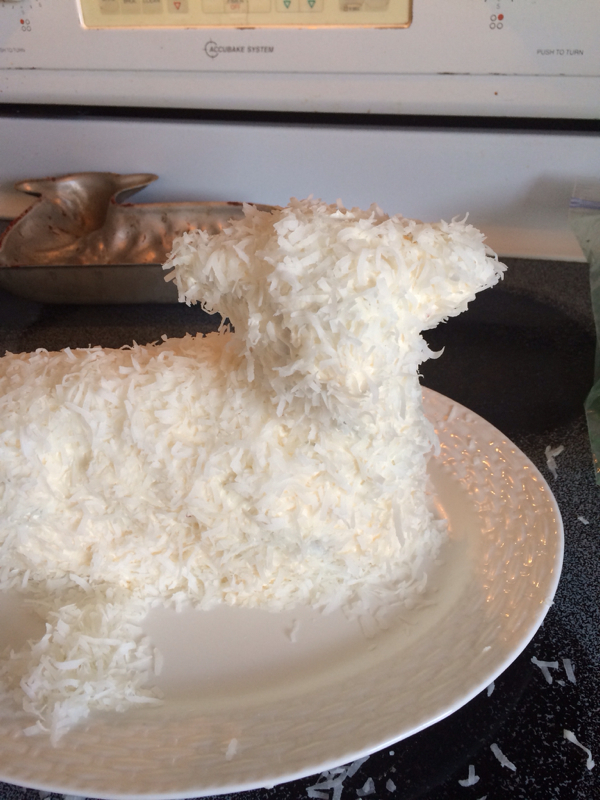 Place a swoosh of frosting on the platter to help "glue" the lamb so he doesn&apos;t slide around. Be very careful frosting around the ears and neck. If the cake is going to break, it will be in these areas. I have fond memories of my mother struggling to reattach an ear with a toothpick, or prop up the neck with whatever object seemed suited for the task. But honestly, I have not had problems with breakage when I omit the oil from the recipe. I think leaving out the oil is key to a firm cake. 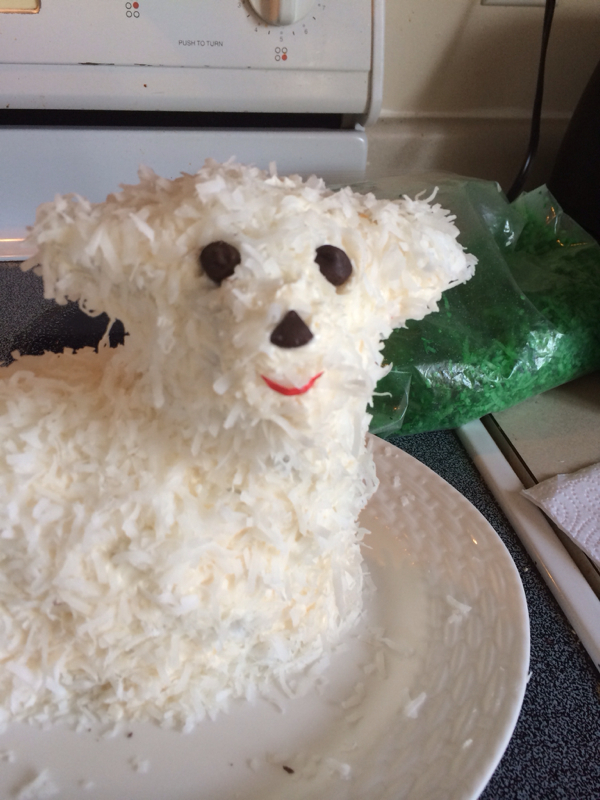 Now, gently pat the shredded coconut around the whole cake. Add his little face by gently pushing in the eyes, nose and mouth. Use a tootpick to help apply the mouth and get it to stick to the frosting. Decorate with colored candy eggs, and you&apos;re done! 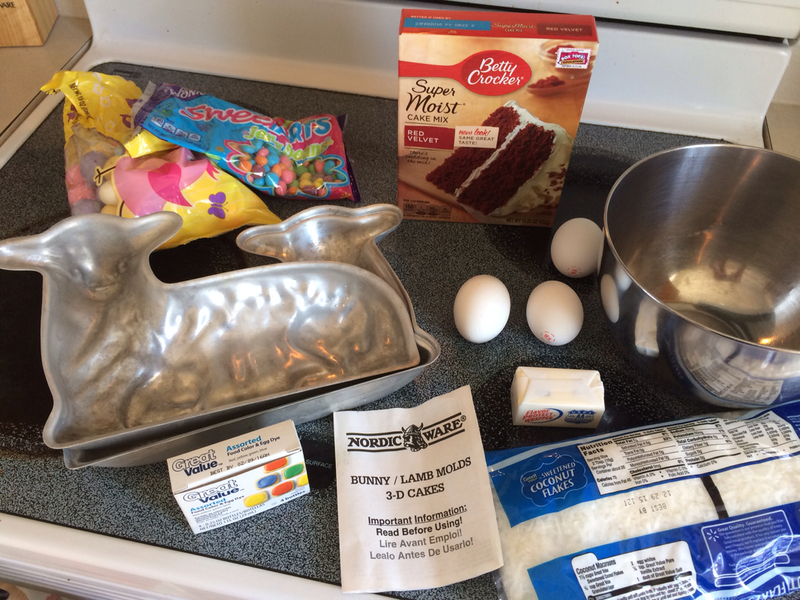 Little ones love to help with the cake, and even the youngest children can shake the grass, scatter around the lamb, and add the colorful jelly beans. I hope you will try this cake, and begin a tradition of Easter memories...such a welcome time of spring, of rebirth and new beginnings, with hope and faith for the future. Give it a try and let me know in the comments how it turns out. I think lemon cake would be great. 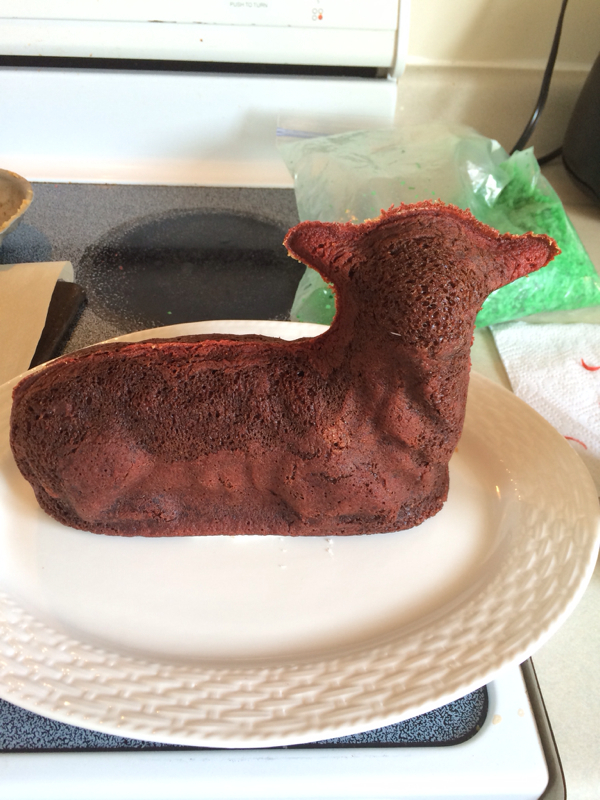 We usually make chocolate, and this year we decided on red velvet cake. Hope the red dye #40 doesn&apos;t cause too much damage. We usually make our cake on Saturday, wrap gently in Saran Wrap and refrigerate overnight. 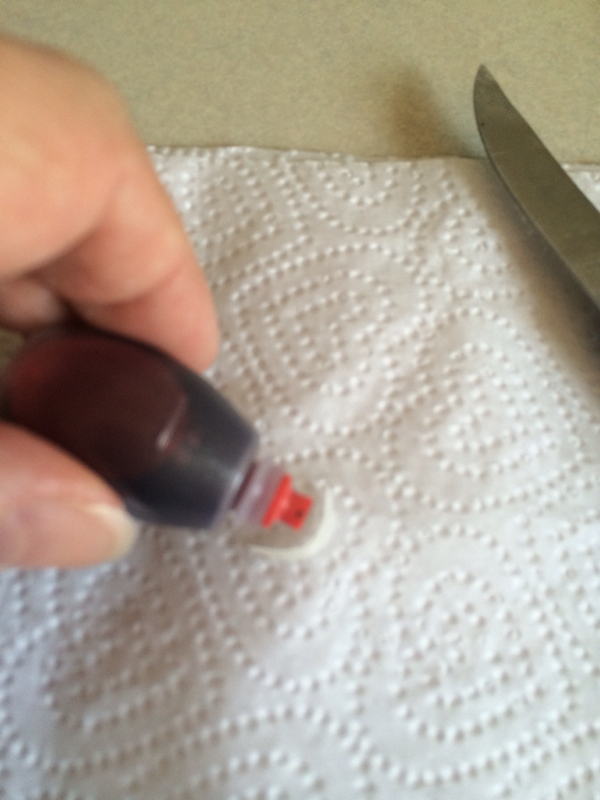 Then remove from the frige an hour or so before serving. Footnote: About 5 years ago, I took the cake out of the frige on Easter Sunday and set it on the kitchen table. 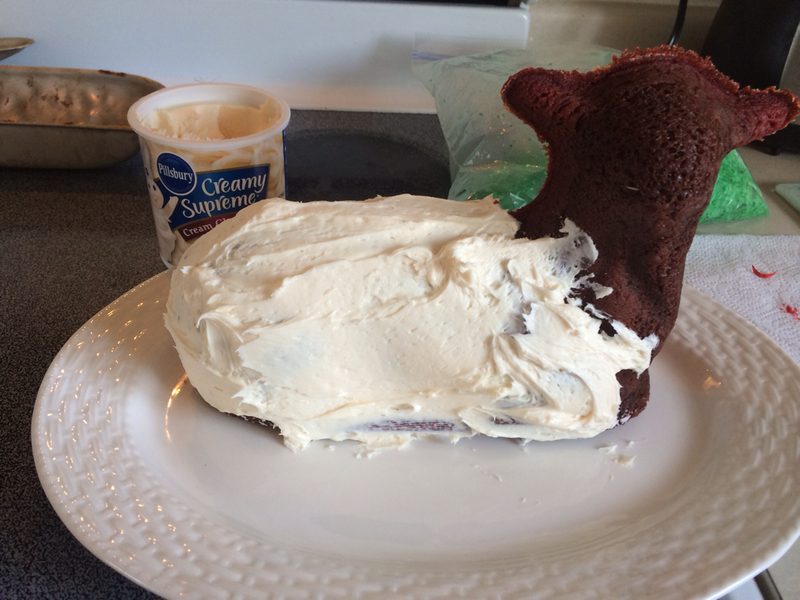 I stepped away to get ready for church, and returned later to find Sophie, our 30 lb pug, on the kitchen table, devouring the lamb cake, right through the plastic wrap!! We must have forgotten to push the chairs in. She&apos;d eaten about 1/2 the cake before being apprehended. She was not invited to Easter dinner. 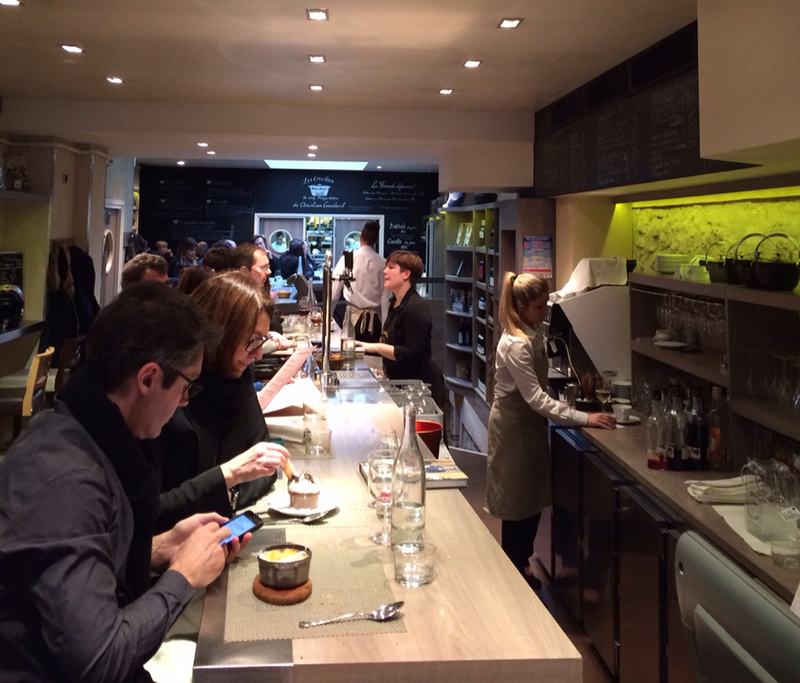 We had a wonderful "behind the scenes" tour at Grenier a Pain boulangerie in Paris recently. Grenier a Pain won the "Best Baguette in Paris" competition several years ago, so you can be assured of their quality. Our sweet guide, Marian, first explained the history of the bakery and described the traditional French pastries created in their kitchens every day. She then took us into the kitchens to learn from the baker and pastry-makers. Great fun, and of course, we left with free samples...baguettes still warm from the oven. Yum!!! 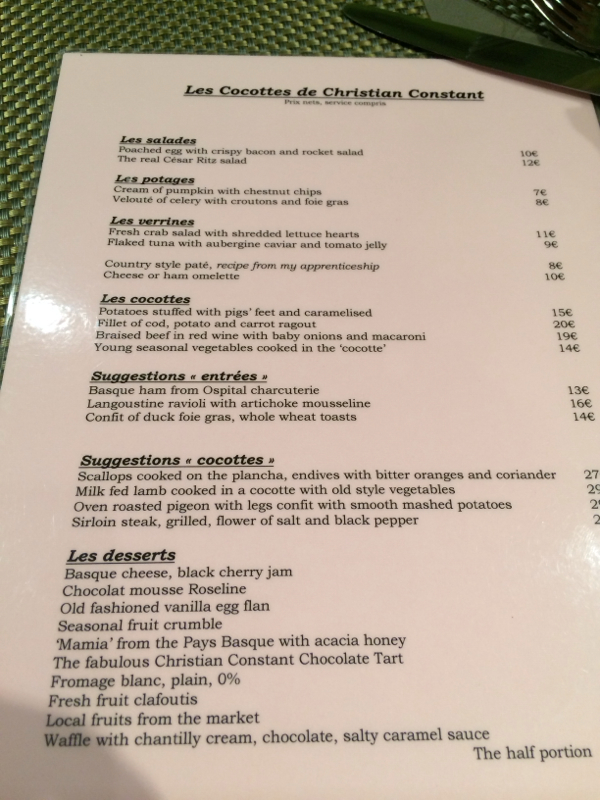 Had a beautiful lunch today in Paris at Les Cocottes, one of Christian Constant&apos;s three restaurants in the 7th arrondissement. Restaurant has a very cool vibe, sleek and contemporary. Diners are seated at high tables or at the long bar. 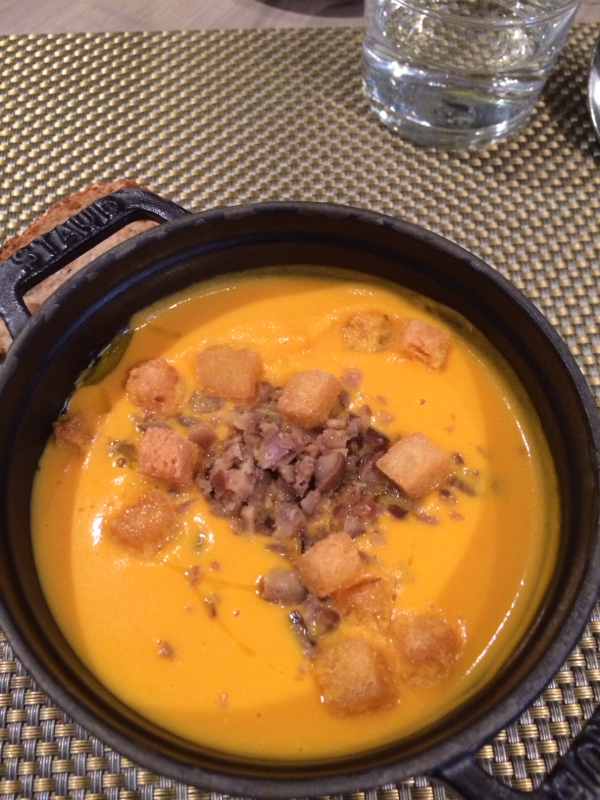 We started with purée of pumpkin soup with roasted chestnuts and croutons. And then came the mouth-watering braised beef in red wine with baby onions and mushrooms. The onions were soft, buttery, melt-in-your-mouth deliciousness. 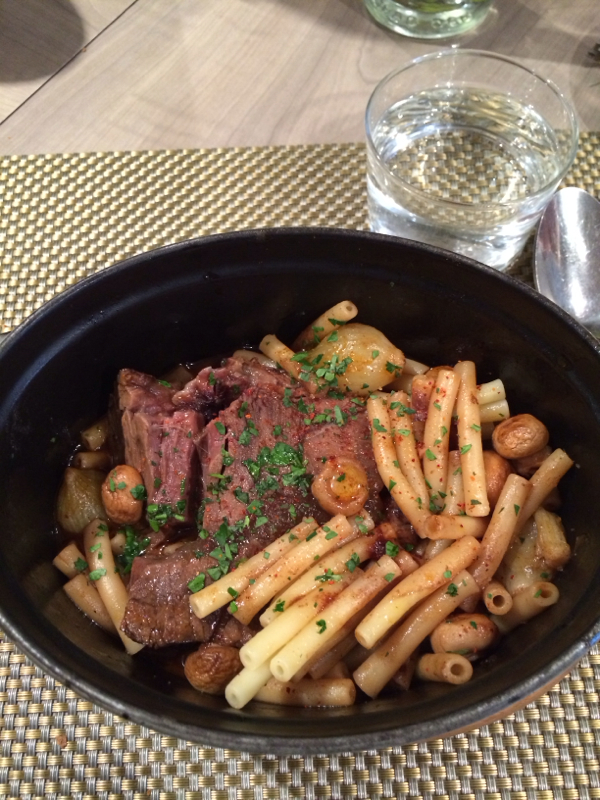 And the beef was so tender, it just fell apart in the cocotte for you. Cocottes are small ceramic dishes used for baking individual servings in. Les Cocottes is located in Paris on rue St. Dominique in the 7th arrondissement. Open 7 days a week, reservations not accepted. Win a Luxury Stay in Paris!! 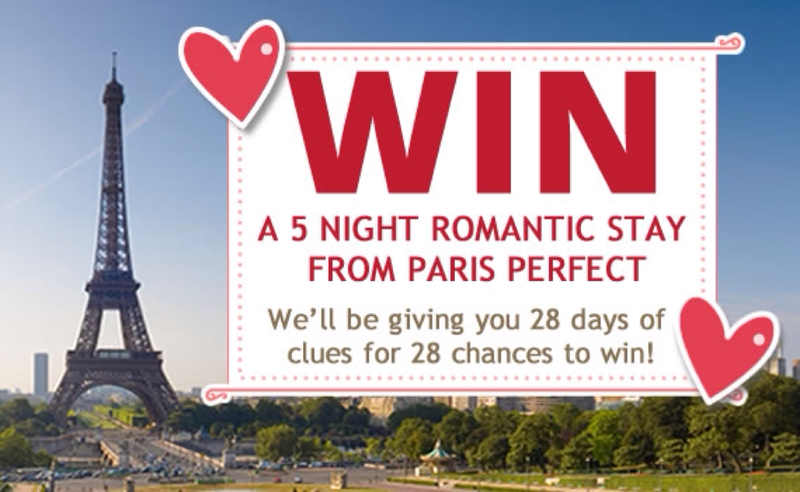 Our friends at Paris Perfect Apartment rentals are having a fabulous giveaway over 28 days. Enter every day for a chance to win this luxe package which includes a five night stay in a gorgeous apartment with breathtaking views of the Eiffel Tower, plus round trip transfers from the airport, sightseeing passes, dinner for two, flowers, chocolates and more!! Answer one trivia question each day to increase your chances to win! 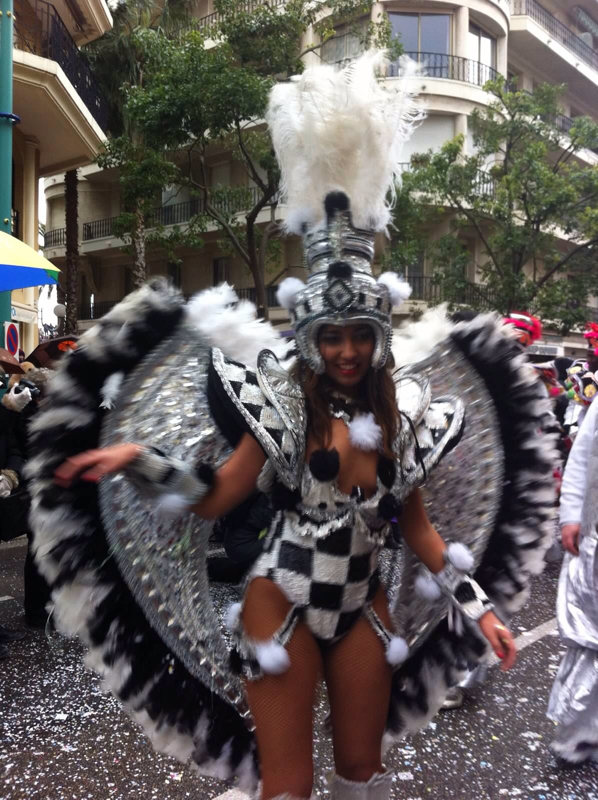 Nice Carnival parades begin Friday, Feb 14, and continue for 3 weekends. 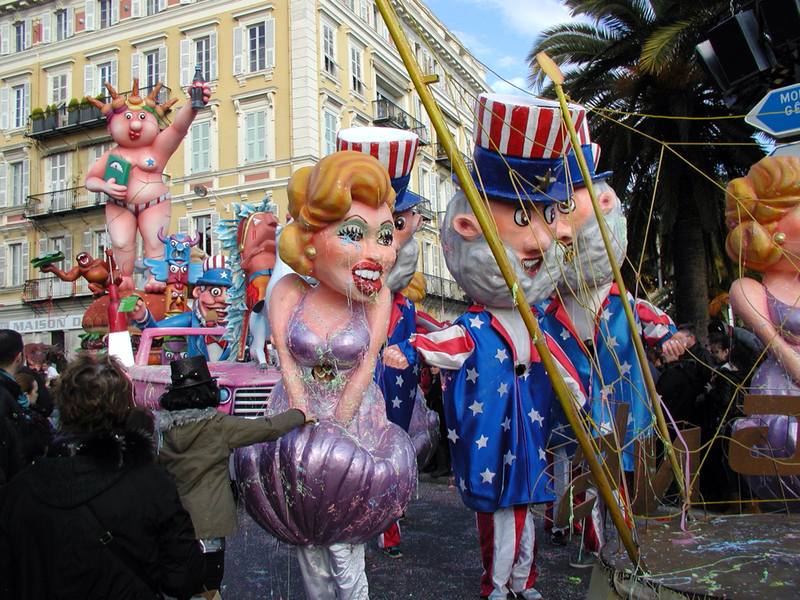 This is the premier winter event on the French Riviera, and the parades draw thousands of spectators each year. 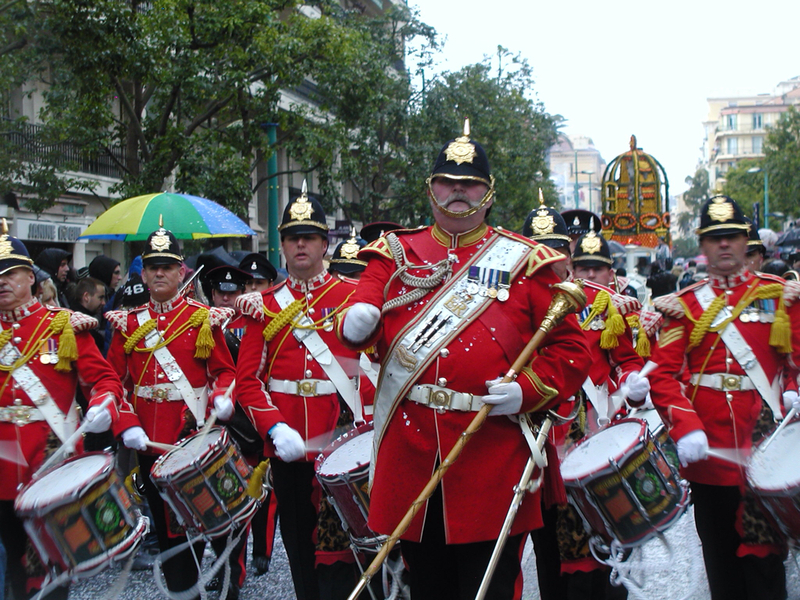 The parades are great fun for the whole family. 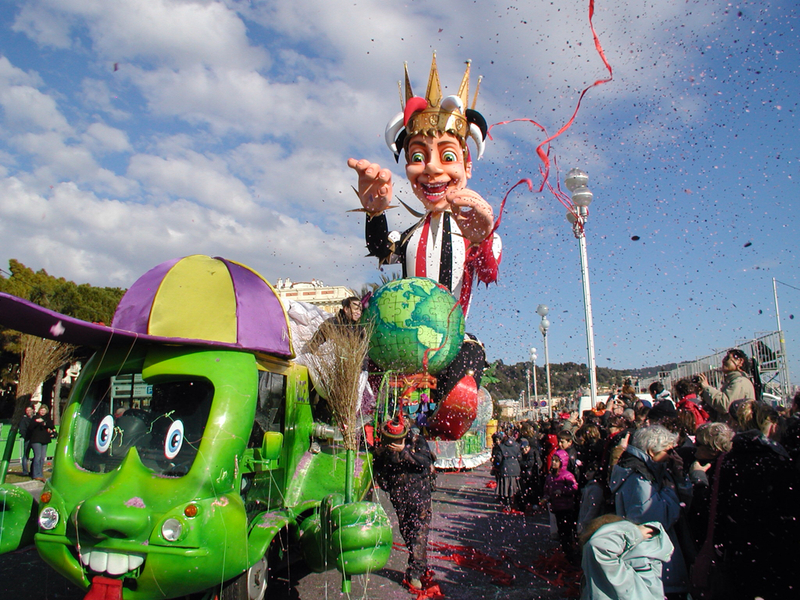 The floats have large fans that blow confetti into the crowds, and the spectators retaliate by dousing the floats with silly string! 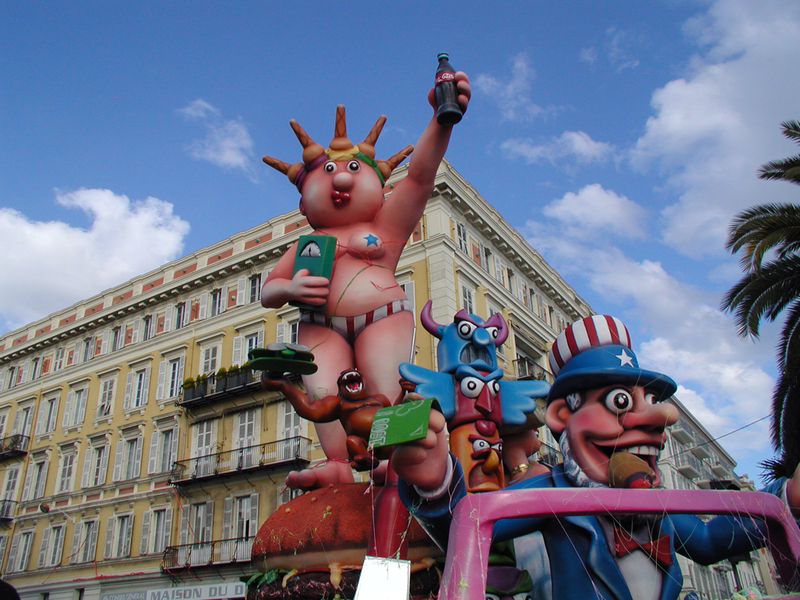 The parades have a different theme each year, and the float designs and construction take months and months of work. 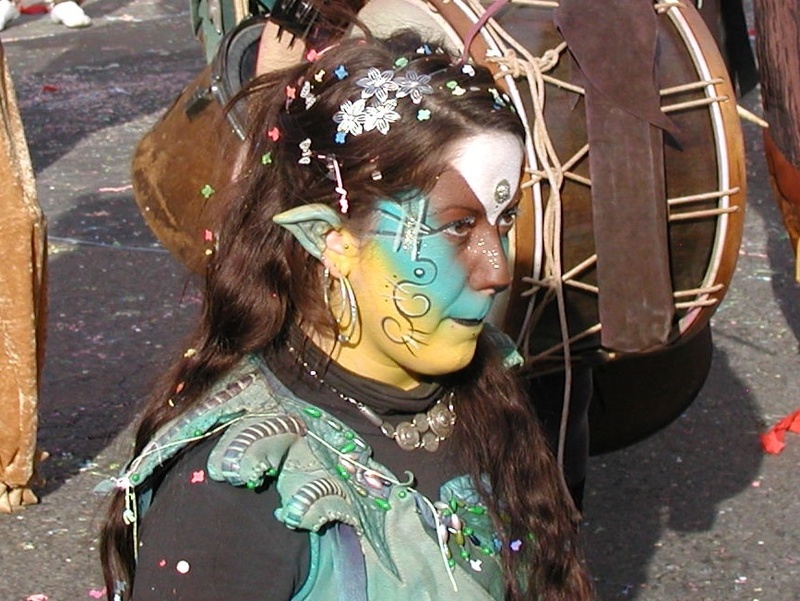 The elaborate costumes and make up are beautiful, and the performers have a flair for drama, often remaining in character, similar to a Cirque du Soleil performance. 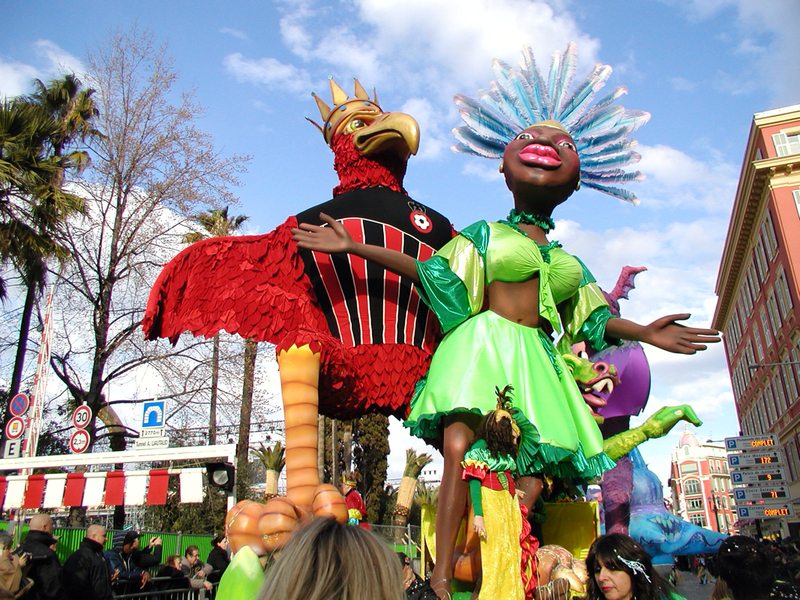 Nice has both a day parade and an illuminated night parade. 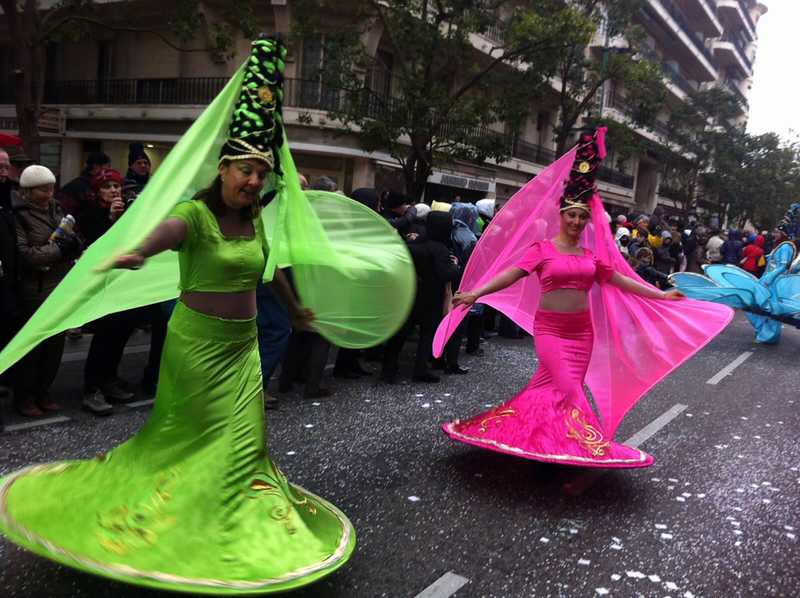 Plus an entirely different "Battle of the Flowers" parade. 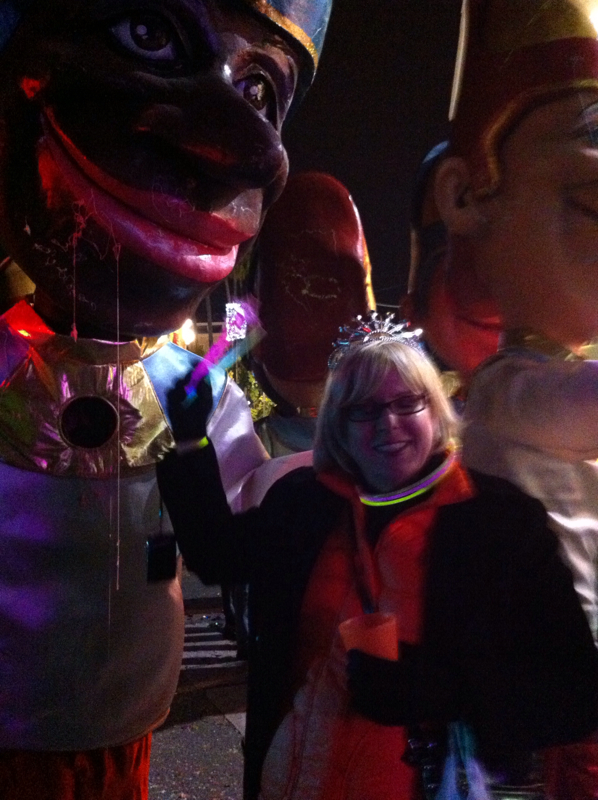 The night parades are slightly more fun! 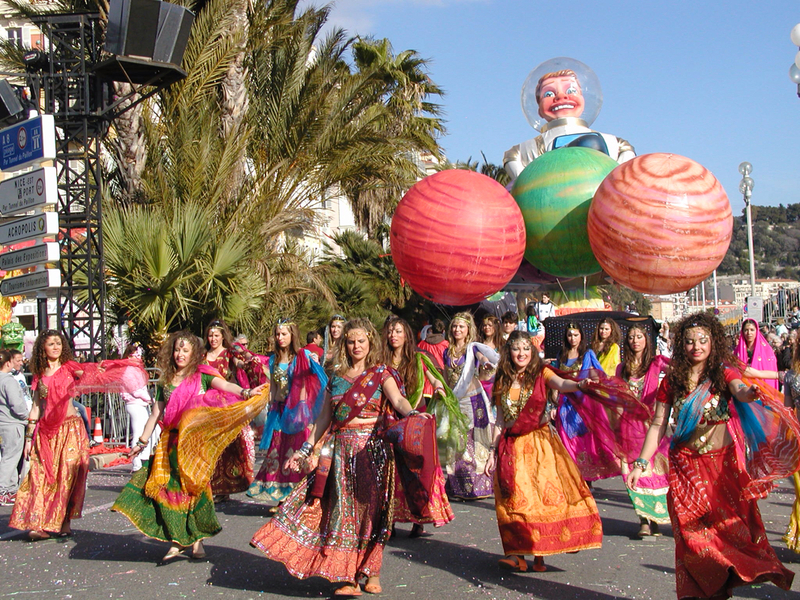 And to expand on the fun, the beautiful city of Menton hosts its own festival ~ Fete du Citron ~ over the same time period on alternating days. 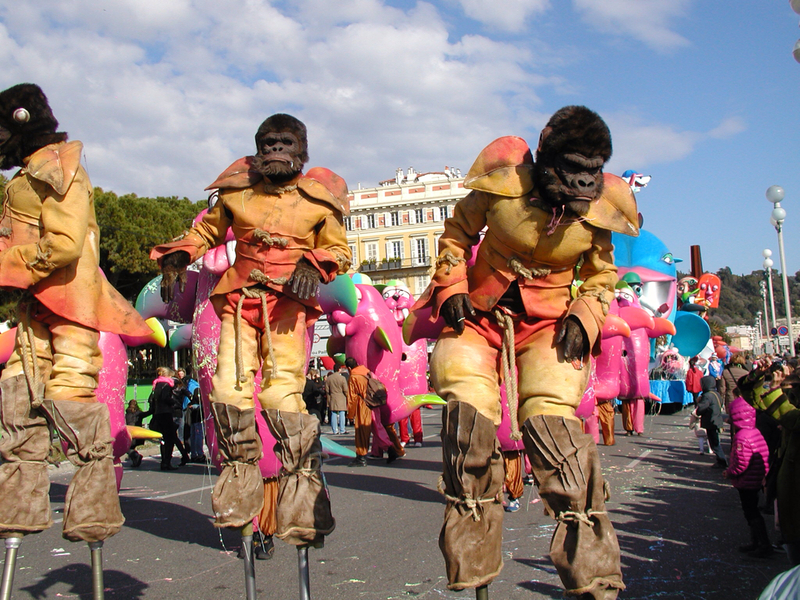 In Menton, they celebrate citrus, which thrive in this mild Mediterranean climate. 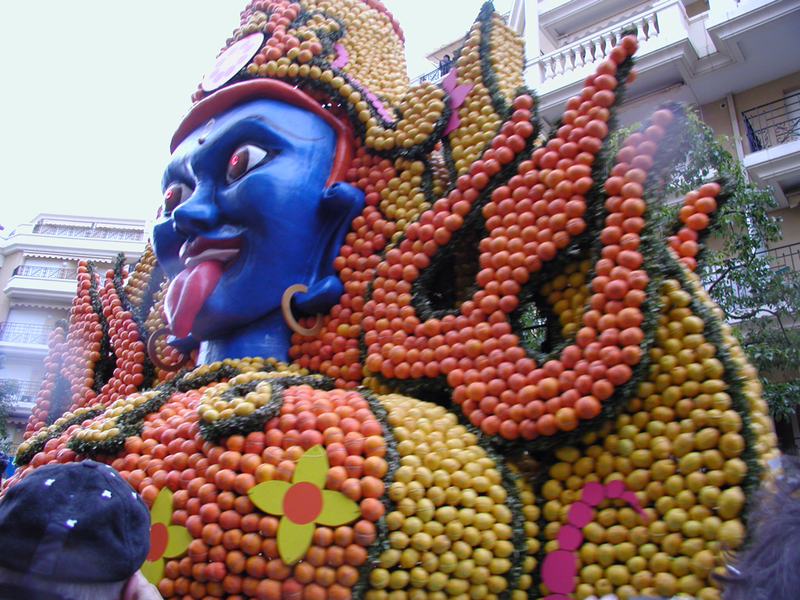 The floats in the Menton parade are made from lemons and oranges. 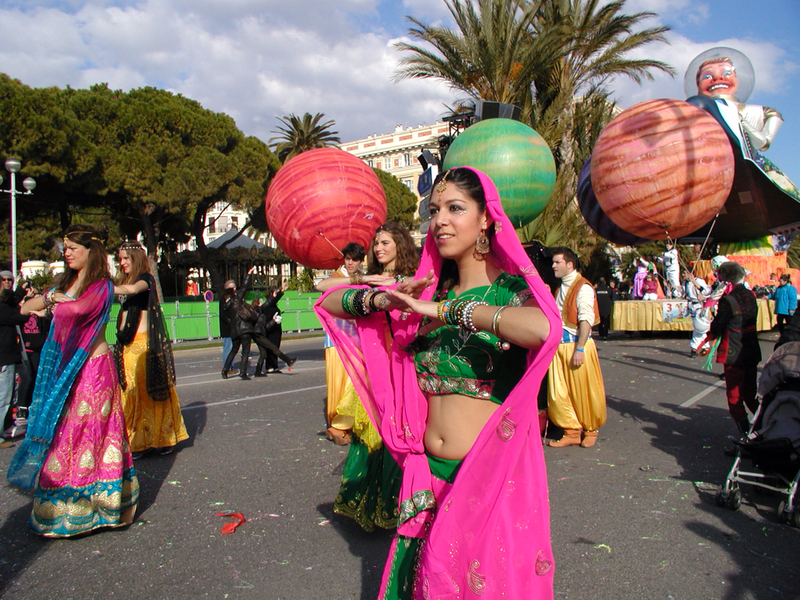 And with the sun, sand and beautiful aqua waters of the Mediterranean as your backdrop, it's easy to see why Carnival on the French Riviera is so popular! Definitely one to add to your bucket list! We’re leaving Roussillon, and traveling about an hour to the southwest, en route to Les Baux de Provence. Les Baux is a medieval village situated on a rocky outcropping in the Alpilles mountains, and is most noted for the castle ruins. Centuries ago, it was the seat of a powerful feudal establishment that controlled 79 towns and villages in the vicinity. Today, you can wander around and imagine what life was like, defending your castle from all those marauding invaders, who sought to plunder, pillage, and steal your land. 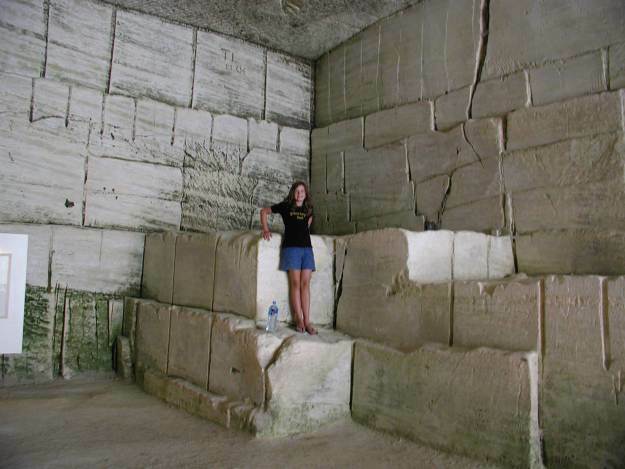 In peak season, Les Baux is a tourist mecca, with day-trippers coming to explore the ruins. If you’re lucky, you may happen upon colorful medieval re-enactments complete with costumed knights jousting on horse back, and medieval maidens in colorful garb. 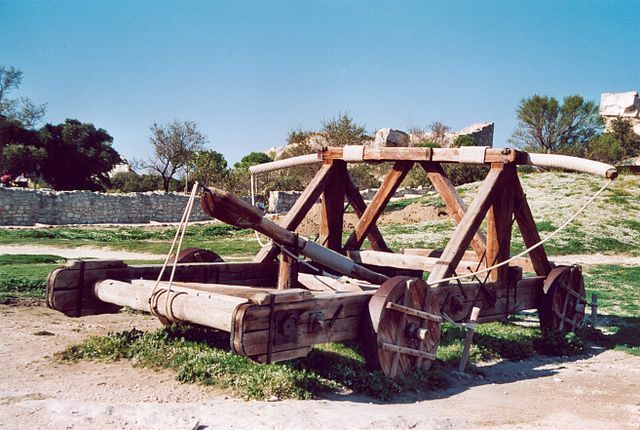 Check out the medieval catapults! Despite all the attractions of this medieval Disneyland, the reason I visit Les Baux (and the whole reason I’m writing this post) is to introduce to you the incredible “museum” down at the base of the village of Les Baux. Carrières de Lumières (formerly known as Cathedral d’Images) is an absolute “must see” and worth a long detour. It is an unforgettable sensory experience, the likes of which you cannot imagine. Leave it to the French to create a museum where the less imaginative of us would only see an abandoned limestone quarry. The “museum” was an active quarry until the mid-1900s, as you can see the worker in this photo scoring the stone in preparation for harvest and removal. Limestone is bright white, and because of the harvesting techniques used, the remaining flat walls of the quarry have become the perfect natural backdrop for the most unique artistic display I have ever seen. You can see how high the walls are from this photo. 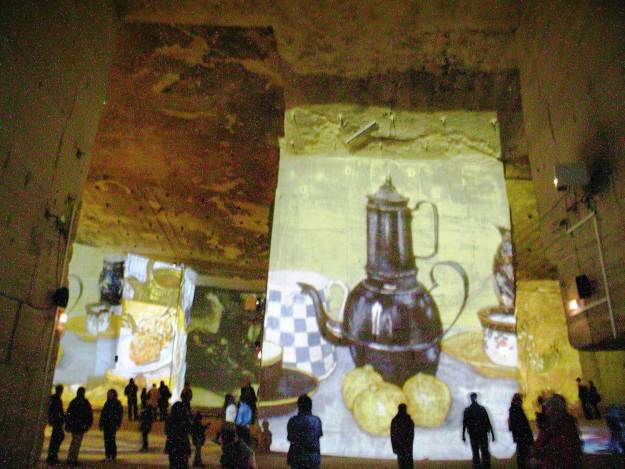 The empty cavern has been turned into a multi-media feast for the senses. 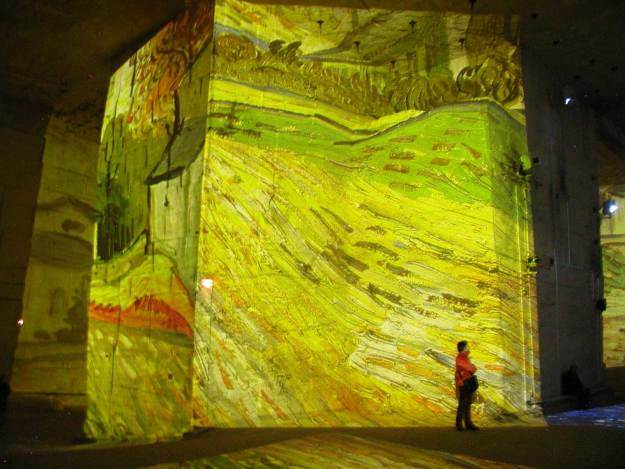 Using a series of 50 projectors, thousands of art images are projected on the 20 foot high walls, as well as the ceiling, and floors. A soundtrack is written especially for the each exhibit, and the slide show is professionally synchronized and choreographed to the music. If you visit in the summer, you leave the blazing sun and bright white light of the Provencal countryside, and enter into a dark, cool, cave. You are enveloped by the darkness, and the cave’s sharp contrast to your senses can be unnerving at first, as your eyes try to adjust to the light. You stumble around a bit, trying to get your bearings, hoping here is a handrail. But then, you hear the strains of the beautiful music, and off in the distance, the huge, colorful images come into view. As you are drawn down into the heart of the quarry, you start to feel as if you are becoming part of the paintings. The works of a different artist are featured each year, In 2014, the works of Austrian artist Gustav Klimt will be featured "Klimt & Vienna: A Century of Gold and Colours". Visiting the cave was an extraordinary, life-changing experience for me, as I looked around at the moving, visual feast. 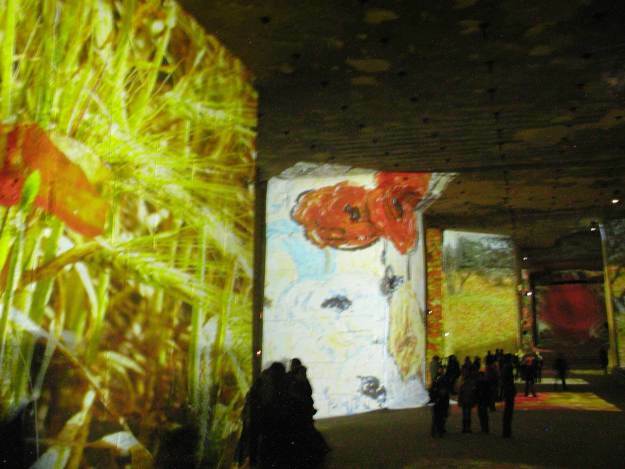 The image below ( from my visit in 2009) is projected on a wall about 20 ft. high. 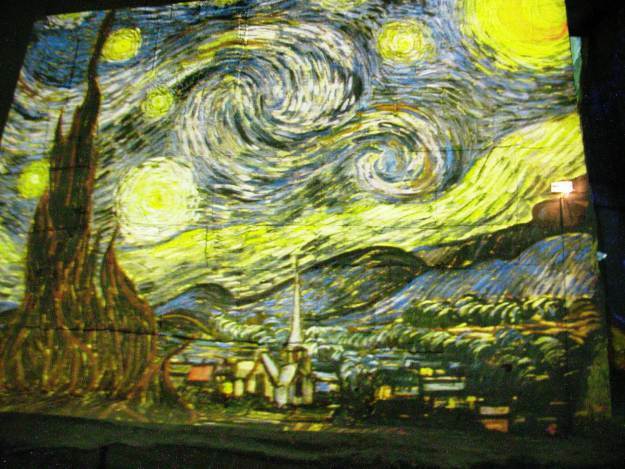 Look closely and you can see the score marks in Vincent's "Starry, Starry, Night". Stunning….powerful….masterful….magnificent……and something you must see and experience for yourself. I get goose-bumpy just thinking about it. This has to be in one of those “Hundred Places to See Before You Die” books. If not, I’ll have to start my own list! C’est magnifique. Today we leave L’isle Sur la Sorgue and travel about 30 minutes east to the ochre cliffs of Roussillon (roo see yohn). Designated as one of the most beautiful villages in France, Roussillon is a small, quiet village, famous for its beautiful ochre cliffs. 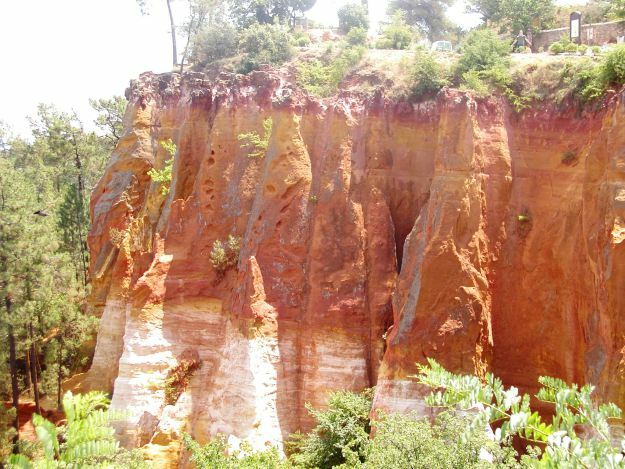 Surrounded by a beautiful pine forest, Roussillon was home to a thriving ochre industry that began in the late 18th century and flourished well into the 20th century. The ochre was harvested and used to tint paints before artificial pigments were introduced. As you look across the cliffs, you see the whole color palette that inspired Cezanne, Van Gogh, Monet, Renoir and other great artists. Every shade of burgundy, red, rust, crimson, rose, salmon, peach, gold, saffron…even green is evident in the cliffs on which the village is built. The rich, varied hues are everywhere, in the facades of the buildings, the trompe l’oeil paintings, as well as the pottery and textiles. Active travelers will enjoy one of the two hiking paths that wind through the pine forest…there’s a 30 minute loop and a 1 hour loop. Art enthusiasts may want to check out the Conservatory of Ochre and Applied Pigments, where you will learn the history of the pigment industry and can join in on artist workshops. But today, let’s just sit in an outdoor café and enjoy lunch overlooking the valley below, surrounded by the rich, vibrant hues. You’ll feel like you are part of the painting itself. Pick up some post cards, tableware or small pottery items to take the beautiful color palette home with you. Choosing your favorite village in Provence is a little like choosing your favorite child…..an impossible task!! You love them all! Though I try to be impartial, there are a few special villages that have captured my heart. Come along with me over the next few posts and I’ll introduce you to some of my favorites. Let’s start in L’Isle sur la Sorgue. Phonetically, you would pronounce this something like … Leel sur la sorg. But roll that “r” in the back of your throat. L’Isle sur la Sorgue is known as the “Venice of Provence”, for the Sorgue River that splits just north of town, and winds it’s way through the village via a network of canals. I’m not sure I’d call it the “Venice of Provence”, but I would definitely call it the “San Antonio Riverwalk of Provence”. My daughter calls it “the easiest place to get lost in the world”, but that’s another story…. (something about mom’s ability to get hopelessly lost even with the rental car’s GPS system, whose annoying female voice my son nicknamed “Giselle”……her perky accent got on my nerves after a while). Sit outside in the evening and savor Provencal cuisine at one of the many outdoor cafes lining the crystal clear canals. Feed Mother Duck and her babies scraps of baguette as you wait for your entrée. If you go in mid-summer (recommended), as you approach the village, you will be greeted on the outskirts by fields of brilliant sunflowers……which I probably never would have stumbled upon if I hadn’t gotten us hopelessly lost! Good thing I didn’t listen to Giselle. 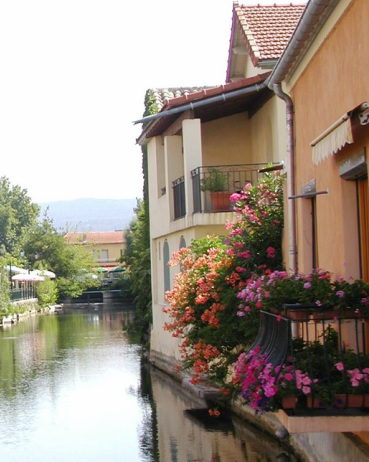 L’Isle Sur la Sorgue comes alive on Thursdays with a delightful Provencal market. And on Sundays, the village hosts the largest antique flea market in France, outside of Paris. Arrive very early if you have any hopes of finding a parking spot. Or better yet, spend Saturday night in one of the local hotels or inns and you’ll be in the heart of the action come Sunday morning. Did you know France produces over 1,000 types of cheese? Amazing!! And there is much more to be found that just Brie and Camembert! These websites are devoted to the cheeses of France. They have regional maps, showing the areas where each cheese is produced, with description of the flavors, the processing methods, suggested food pairings, and more. Check theses out. No Velveeta here!